Did you know that 3 out of 4 women, occasionally, suffer from vaginal discomfort? 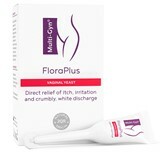 Dryness, discharge, pruritus and irritations are just some of the problems that women feel the most; and their solution often lies on rebalancing the vaginal flora. In this sense, Multi-Gyn offers a complete range for cleansing and care for your intimate area; thus being able them to meet the women's diffrent needs.